We have some exciting news we want to share with you. Please feel free to share this around! One of Cheltenham's best-loved and most historic buildings is on the brink of a redevelopment that will help it become a community performing arts centre for the 21st Century while uncovering much of its fascinating past. The Playhouse first started operating as a theatre in 1945 and its former life as the Montpellier Baths goes back to the early 19th Century when it was central to Cheltenham's spa heyday. Now our board of trustees believes it is time to open a new chapter in the building's long history: they are determined to secure the Playhouse as a viable and accessible performing arts venue for the enjoyment and participation of all sections of society whilst preserving and respecting its rich heritage. 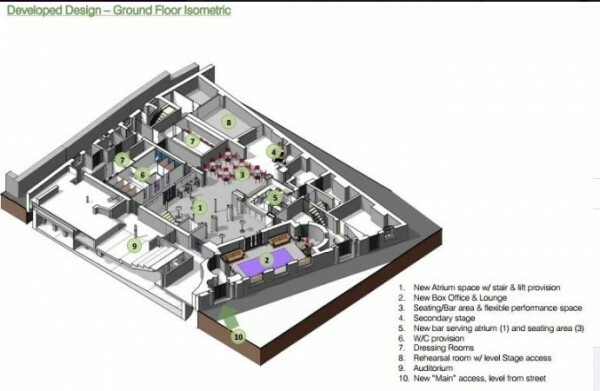 Central to the plans is a redevelopment of the building to make it more flexible and fit for purpose as a vibrant hub for a wide variety of performing arts. Today, Friday 1st March, we have submitted an application for planning permission with Cheltenham Borough Council. * Create a permanent exhibition of the building's rich and extraordinary past. Chair of trustees Malcolm Ball says: "We want the Playhouse to become a hub for the Bath Road vicinity that will enrich and contribute to a vibrant Cheltenham town centre. It will be a hive of activity that will be a lively and happy place to visit and participate in. "We have been working on plans for the Playhouse for nearly two years and we're excited that we're ready to apply for planning permission. 2020 will be the 75th anniversary of the building being converted into a theatre and this is the perfect time for the Playhouse to enter the next phase of its amazing history. Its rich heritage isn't that well known: few of our audience members know that when they are enjoying a performance in our main auditorium they are sitting above a 19th Century swimming pool! "We have worked with specialist heritage architects Poole Phillips and renowned archaeologists to ensure our redevelopment plans are sensitive to the patchwork of historic developments going back more than 200 years, and we want to make this past as open and interesting as possible for the benefit of visitors." In recent years the Playhouse has become a venue for a wide variety of local and touring performers, not just theatre but live music, comedy, dance, poetry, burlesque, improv and film. Malcolm adds: "The profile of those performing and visiting the venue has evolved considerably over the years and changes need to be made to the venue to secure its future and ensure it is still relevant for generations to come. "However, the building's layout doesn't make it easy for patrons to experience the wide range of performances now available, or for us to offer flexible spaces to performers and other hirers. Our proposals aim to expand the buildings' remit and greatly improve the visitor experience of everyone using the venue, including better access, updated décor and an improved food and drink offering. "We have been liaising regularly with council officials about our plans for redevelopment and they have been supportive in principle of our approach. If planning approval is given and funding is in place, we believe the work will take ten months to complete." Below is an artist's impression of what the new atrium space with glass ceiling will look like, together with design cutaway models showing many of the proposed changes. The Playhouse, which is a Grade II listed building, is owned by Cheltenham Borough Council and leased to a registered charity led by a board of trustees and supported by over 100 volunteers. It began life circa 1806 as Henry Thompson's manufactory for The Real Cheltenham Salts and over the years was enlarged to incorporate slipper baths, a swimming pool, a steam mill and bakery and medicinal spa, whilst also being used for dances, an indoor cricket school, cycling lessons and gymnasium. After operating as an ARP centre during WWII it was converted to a theatre in April 1945.